This hundred-year-old institution is the oldest of its kind in the country and offers the national as well as the foreign visitor the possibility of admiring well cared for plants originating from all parts of the planet. The incomparable greenery envelops the whole garden of the Pearl of the South and its palm collection is so complete that experts have stated that it can be considered one of the most complete worldwide. Over a thousand species, from the exuberant Ceiba tree to a herbarium containing great varieties of the beautiful Caribbean flora, can be seen. 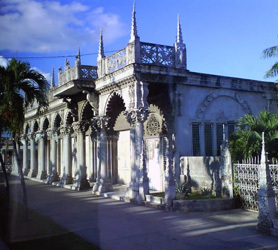 This majestic park in Cienfuegos treasures many arboreal species as well as fruit trees, and includes an area for the conservation of exotic plants. Due to its attributes this botanical garden has been declared a National Monument.